In her series of images dubbed 'SOUP', artist Mandy Barker thoughtfully creates peaceful still-life photographs that belie the unsettling truths about the immense amount of man-made garbage polluting the world's oceans. From plastic turtles to fake flowers to fishing lines, Barker collects debris from beaches around the world and assembles them like ingredients for each version of her SOUP photos. 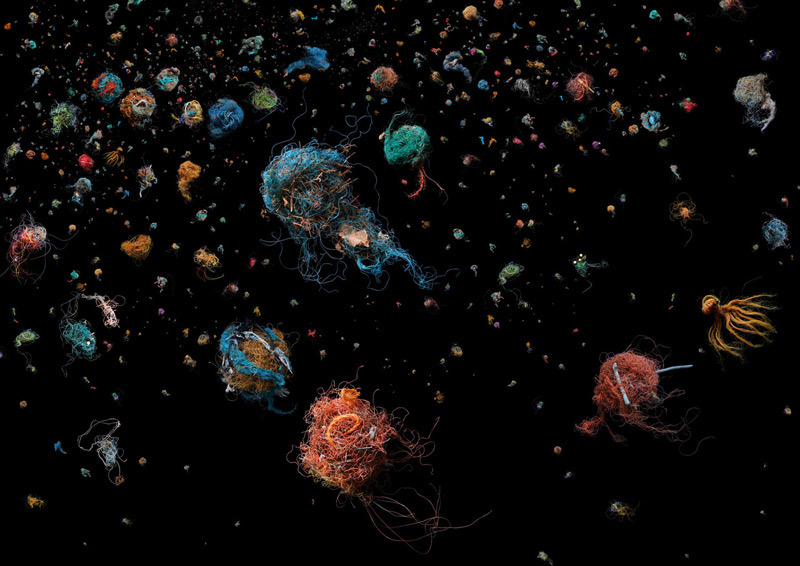 The images she creates channel the devastating and toxic enormity that is better known as the Great Pacific Garbage Patch. Barker sorts and categorizes her collected trash, before assembling it into collages against a flat black background. In ‘Birds Nest’ she gathers fishing line and the debris caught in its path, while in ‘Tomato’ she assembles all manner of red hued debris. The resulting photographs possess an otherworldly feel, as eroded yet vibrant forms are placed in such a way as to suggest a tide coming into shore or a distant galaxy, or perhaps the nebulous of the garbage patch itself. She creates an organic formation of an inorganic intrusion. The ingredient lists, along with the sheer number of individual elements in each photograph, invite closer inspection. In ‘Refused’ teeth marks point the viewer to the marine life impacted by the photograph’s subjects. Viewed as a whole, SOUP “reveals a narrative concerning oceanic plastics from initial attraction and attempted ingestion, to the ultimate death of sea creatures.” The final image in the series ‘500+’ neatly assembles a horrifying quantity of plastic debris found in the digestive tract of the dead albatross chick, such as the one that first drew Barker to create SOUP. The scope of Mandy Barker’s subject is enormous, The Great Pacific Garbage Patch is the largest trash dump on earth, spanning hundreds of thousands of miles, bringing devastation to marine and wild life in its path. Barker’s aim, to “stimulate an emotional response in the viewer by combining a contradiction between initial aesthetic attraction and social awareness” has been met with success. She has encountered people who “haven’t heard of the ‘garbage patch’,” while “others have been shocked by the diverse content of plastics found in the world’s oceans and have asked what can be done.” The British-based photographer is now seeking support to expand upon the project. Barker sorts and categorizes her collected trash, before assembling it into collages against a flat black background. In 'Birds Nest' she gathers fishing line and the debris caught in its path, while in 'Tomato' she assembles all manner of red hued debris. The resulting photographs possess an otherworldly feel, as eroded yet vibrant forms are placed in such a way as to suggest a tide coming into shore or a distant galaxy, or perhaps the nebulous of the garbage patch itself. SOUP: Refused, Ingredients: plastic oceanic debris affected by the chewing and attempted ingestion by animals. Includes a toothpaste tube. Additives: teeth from animals. She creates an organic formation of an inorganic intrusion. The ingredient lists, along with the sheer number of individual elements in each photograph, invite closer inspection. In 'Refused' teeth marks point the viewer to the marine life impacted by the photograph's subjects. The photography project was not initially conceived of as a study of the environmental impact of ocean trash, rather Barker told us, she was "interested in collecting natural objects from the shore." As she did so she "began to notice there was more and more man-made debris amongst [the natural objects]." At the same time, Barker notes "I came across an image of an albatross chick carcass that had died from ingesting plastics mistaken for food it had collected from the 'garbage patch,' it's stomach full of cigarette lighters and bottle tops. Following further research of how plastics affect marine life and ultimately end up in the human food chain, I felt this was a subject I could not turn away from." Viewed as a whole, SOUP "reveals a narrative concerning oceanic plastics from initial attraction and attempted ingestion, to the ultimate death of sea creatures." 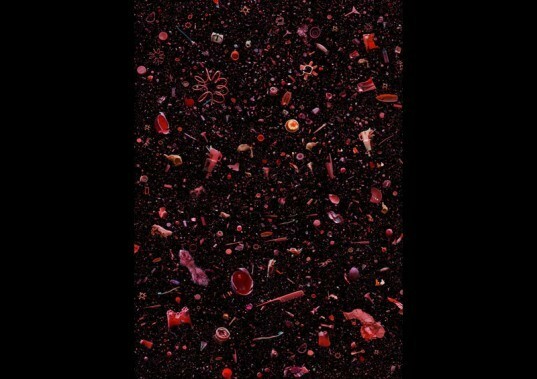 The final image in the series '500+' neatly assembles a horrifying quantity of plastic debris found in the digestive tract of the dead albatross chick, such as the one that first drew Barker to create SOUP. Barker's aim, to "stimulate an emotional response in the viewer by combining a contradiction between initial aesthetic attraction and social awareness" has been met with success. She has encountered people who "haven't heard of the 'garbage patch'," while "others have been shocked by the diverse content of plastics found in the world's oceans and have asked what can be done." The British-based photographer is now seeking support to expand upon the project.